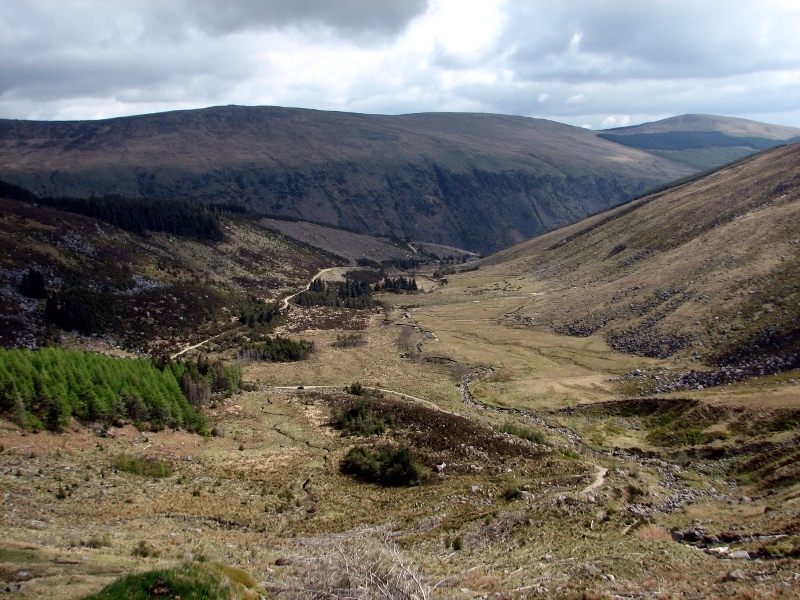 Known locally as “Lug,” this is an impressive mountain standing at 925 meters in the south of the Wicklow Mountains. It is the highest point in Leinster, not to mention Wicklow. Further, it is the 13th highest mountain in Ireland and one of 14 Irish Munros*. My friend Ross and I walked from Glenmalure via the Fraughan Rock Glen and returned by the same route. Our walk took 4hrs 15 minutes, including 20 to 30 minutes for lunch. This is a walk you’ll feel in your legs the next day. * A Munro is a mountain of over 3,000 feet. Other county tops I’ll be visiting that feature in the list of Irish Munros are Carauntoohil in Kerry and Galtymore in Limerick. The term is named after Sir Henry Munro who produced a list of Scottish hills of 3,000 feet and over in 1891, the first such categorisation. Even as you drive the last few miles of the journey from Dublin to Glenmalure you get the sense that this is going to be a great walk. Passing by Laragh and signs for Glendalough feels like taking an extra step towards the heart of the Wicklow mountains. A sense which grows as the military road descends steeply downhill passing the Shay Elliot Forest before taking a right turn for Glenmalure. Here the road gets increasingly narrow and the walls of the historic U-Shaped valley climbs steeply on both sides as you drive for what feels like miles towards the end of the road. Eventually the road does end at a car park by the Avonbeg river, where you begin your hike. Walk up the path along the river for a couple of minutes until you cross a footbridge. From here continue walking past the seasonally open Glenmalure hostel before shortly hanging a sharp left to follow a track which will take you well up into the Froghan glen. 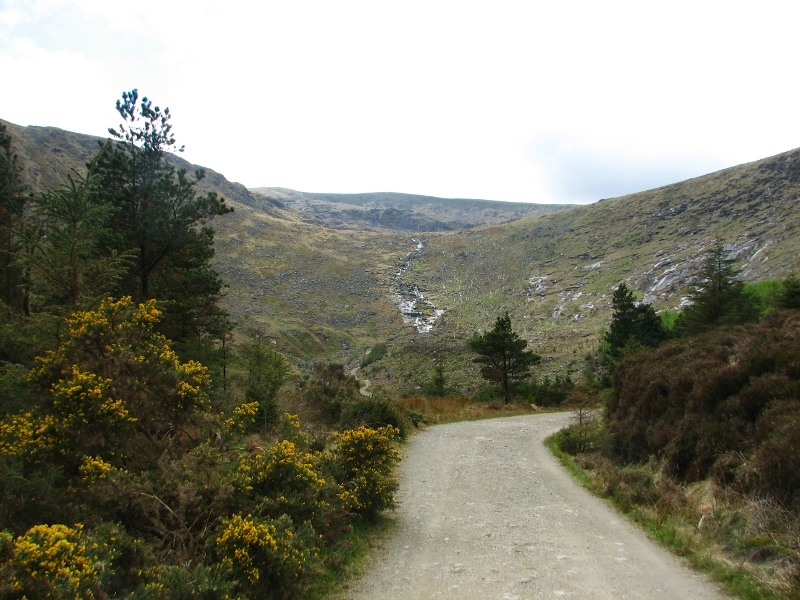 An enticing track continues straight up Glenmalure but that’s for another day. When the path ends after about 15 minutes or so it is time to scramble up the steep head of the glen, keeping the river to your left as you zig zag up and around fallen trees that look from a distance as if they have been felled by a sudden gust of wind or flood of water. On our walk up we passed a car parked just before the end of the track. A few minutes later we could hear voices but not see any people. Looking up we could see a pair of midweek climbers taking on a long route up the crags of Benleagh. They were on their final pitch as we made our way back down from the summit. Once you reach the top of this section a further hanging valley is revealed and the glacial nature of the area becomes clear. You can just imagine the ice gathering in the bowl in front of you before edging over the lip to scrape its way down the path you have just taken. From this point the route[s] to the top become clear. One option is to continue on up the valley towards the ridge, at which point a turn to the South East will bring you to the summit. Beware that if you take this route the boundary of the Glen of Imall shooting range is found just over the ridge and entry must be avoided. We chose to cross the valley – which can be boggy – and take a ramp up towards the south before turning West for one last short steep pull before reaching the western end of the Clohernagh ridge where the slope moderates. At this point, we were exposed to a strong and bitterly cold Northerly wind, so coats hats and gloves were quickly donned before we continued to skirt the drop-off on our right as we approached the summit. The views of the valleys we had just walked were fantastic, while further off we could see many Wicklow peaks such as Tonelagee, the reservoir at Turlough Hill and Kippure. Crossing over to the South Prison in order to minimise the wind we could see the Blackstairs and Mount Leinster almost 30 miles to the south. The summit area is a large flat expanse topped with short grass and a trig pillar that provides a useful shelter from the elements. We took a coffee and sandwiches before making our way back down. We had considered returning by Cloghernagh and Art’s Lough, however time constraints dictated that we return by the same route, which was rewarding as we could now more thoroughly enjoy the views we had our backs to during the ascent. One of the great things about Lug is the variety of approaches that can be taken to reach the summit. It’s a mountain that warrants repeat visits. This was my 13th county top and marks the half way point of my aim to reach the highest point in each county in Ireland during 2010. Some of Ireland’s great mountains lie ahead of me, but Lugnaquilla would be one of the stand out walks I’ve tackled to date in this challenge. Go and take a look, the car park is just over an hour from Dublin city centre, so within 1.5 hours you can be in a different Ireland. While your route may be visible when visibility is good, you could find yourself wandering around a firing range or off a cliff if you get stuck without OSI map 56 when the clouds come down. Feeling lucky, punk? Our walk took in portions of the Lug walk as described by Joss Lynam in his Best Irish Walks collection. This is a reasonably straightforward approach and has the advantage of starting (and finishing near) near the pub in Glenmalure – visibility changes very quickly though and can be snowy in winter so care needed! 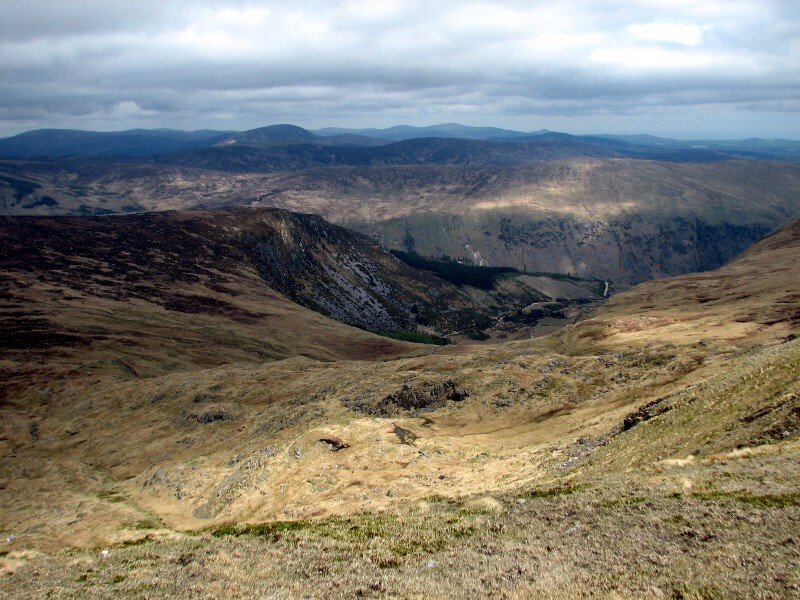 please send me an Information pack on Lughnaquilla and Glenmalure and accommodation nearby and best/worst time/weather patterns/length of time it takes to climb/walk etc. Also please can you send some copies of same to Mr David O’Farrell 95 Beaumont Road Cambridge CB1 8PX Cambridgeshire England. I believe your request has been responded to on the Dublin & Wicklow walks website. I’d second Dave’s comments, which you will find towards the bottom of the page! Well done on your blog. I was over in killary adventure centre and we decided to climb mweelrea on the sunday. Approached from the east side which got very steep. Due to rain and fog we had to turn back. Really beautiful mountain. Being a local, i must put Lug back where it belongs as the third highest mountain in Ireland. Haha probably just a misprint. From my limited experience of Mweelrea I know that it’s not a mountain to be messed with, so turning back sounds like the wise decision! Hey Murray! Love the blog! Just wondering, my year and I are climbing Lug the day after tomorrow for the charity Homelink. The catch, we’re doing it at 3:15AM. However, we will get to see the sunrise! But I was just wondering, what gear would you advise to bring? I’ve never done this before, so I’m quite new to all this! 🙂 Thanks!